This mini pump would easily fit in a small pack, just take it with you during riding in case that your bike need inflating on the way. A necessary companion for riders! 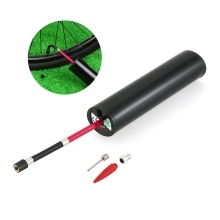 About 1 minute 120PSI for 1 road bike tire, about 3 minutes 50PSI for 1 mountain bike tire, about 8 minutes 35PSI for 195-65/R15 car tire and 4 minutes for 1 motorcycle tire. Built-in rechargeable lithium battery and 1.5 hours to fully charged by 15V charger allows you to pump your tire in case of emergency flat tire on the road. On/off button for convenient control, and high-end 150 PSI gauge show a clear view of pressure. Package included electric air pump, car charger, DC adaptor, air tube, FV adapter, needle, air tap and a carry bag. Easily fit in a small pack so you can inflate your bike, car, motorcycle, basketball and swimming ring with hands free. Note: To prolong the life of machine, you are suggested pumping up the tire with pressure lower than 120PSI, and the working time is supposed to shorter than 100 seconds when the working pressure is 100~150PSI.